Who has More Loyal Fans? Cultivating satisfied, loyal customers has always been an important factor to the success of any business, but since social media has enabled rapid-fire opinion sharing, happy customers are more important today than ever. According to a 2016 Forrester Research report, 72 percent of businesses say improving customer experience is their top priority. In the ongoing coffee wars between Dunkin’ Donuts and Starbucks, recent surveys indicate that when it comes to nurturing customers who will come back for more, Dunkin’ Donuts just may have the upper hand. That’s always good news, but can be particularly advantageous as Dunkin’ Donuts continues to push into western markets—traditionally a Starbucks’ stronghold. Collectively, Starbucks and Dunkin’ dominate about 60 percent of the United States coffee market. According to Boston.com, Dunkin’ has 10,000 stores in 32 countries and sales of nearly $9 billion, while Starbucks has 20,000 stores on six continents and about $13 billion in sales. 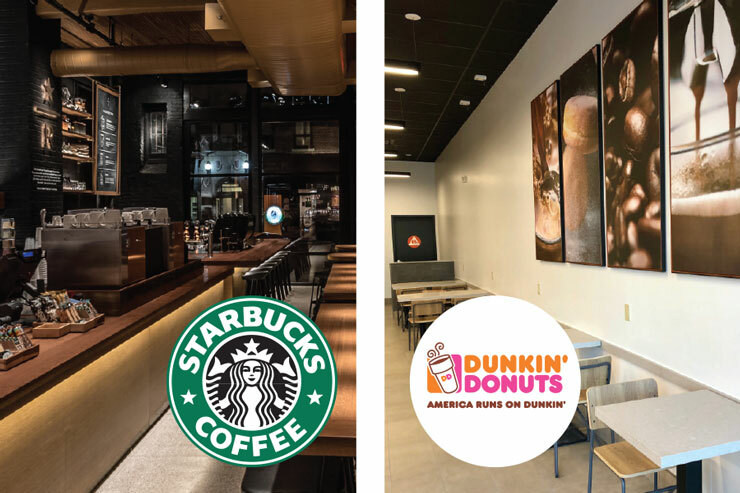 It’s well known that each brand rules in different regions: Seattle-born Starbucks is popular on the west coast, while Boston-based Dunkin’ Donuts is favored by much of the east. A survey from market research firm Nielsen took a closer look at the loyalty of each brand’s customers. In Seattle, just over one in three adults reports patronizing a Starbucks within the past 30 days, ranking that city No. 1 in market penetration. Tacoma is behind Seattle at 31 percent of adults, followed by San Diego, where about 30 percent of adults say they’ve patronized a Starbucks. Denver and Portland also fall in the top ten in terms of market penetration. On the opposite coast, Dunkin’ fans are tighter, especially throughout New England: In Boston, about 47 percent of adults reported making a stop in the past 30 days. In Manchester, New Hampshire, that figure is closer to 50 percent. Providence, Rhode Island is also strong, with 46 percent of adults attesting to patronizing a Dunkin’ Donuts shop in the past month. Each brand draws a different type of clientele, according to Nielsen. Starbucks visitors have a higher median household income, are likely to be college educated, and are younger. Nielsen’s study found Dunkin’ draws an older crowd, but both brands rank high with women: Starbucks attracting approximately 59 percent and Dunkin’ Donuts 55 percent, according to the survey. As the owner of a lone Dunkin’ shop amid a sea of 14 Starbucks, Matt Cobo of Walnut Creek, California, knows the importance of making each customer’s visit exceptional. While his store has a healthy showing of regulars, Cobo says newcomers who frequent his shop are either those who know of the brand – often transplants from other regions – or those who are unfamiliar, but curious. While satisfying each group is important, Cobo and his team steadily work toward winning over the latter. It’s a battle he feels Dunkin’ can win. “We need to make it easy for them; educate them in their own language. They’ll order in Starbuck’s language, and ask us what we call it – we’re much simpler. Our sizes are in English,” he tells them, joking that he’d love to post a Starbucks-to-Dunkin’ equivalency chart. “Once they realize we offer a superior product at a great value, they come back. People who try us, love us,” says Cobo. He’s presently gearing up to open another Dunkin’ in the area, as part of a 14-shop development plan. “On the East Coast, Dunkin’ loyalty seems to be in the DNA, the genetic makeup. On the West Coast, there’s still a certain energy or enthusiasm for Dunkin’; we just need to penetrate the market more,” he says. 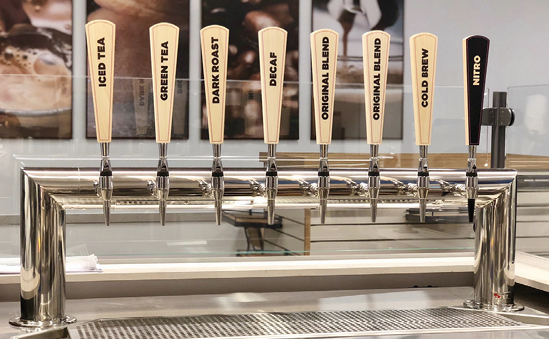 Robert Byrne, an analyst at Technomic, the Chicago-based foodservice research and consulting firm, sees this as an optimistic time for Dunkin’ Brands to explore West Coast market penetration. According to results from Technomic’s consumer brand metrics survey, an ongoing study in which responses are collected from 100,000 consumer visits to numerous United States restaurant chains, Dunkin’ seems to be at the heart of a devoted following. “Even though the Dunkin’ footprint is smaller in the west, their survey responses there are higher than in other parts of the country,” he explains, adding that Starbucks’ ratings are more even throughout the country. So while there are fewer Dunkin’ patrons in the western regions, those who are there are true fans. “One [measure] is the customer’s intent to return to the restaurant. In the west, 38 percent of Dunkin’ Donuts customers responded with an intent to return, while Starbucks showed 34 percent,” Byrne says. 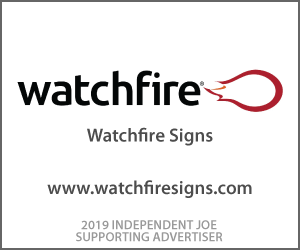 Another benefit of a strong loyal base: word of mouth referrals. According to Technomic’s metrics, 34 percent of Dunkin’ Donuts customers intend to recommend the store to someone else, compared to 26 percent of Starbucks customers. When it comes to rolling into new territory, the thumbs-up from those already loving the product is a golden asset. Finally, when rating each chain on its ability to provide value on high-quality menu items, in the western regions, 34 percent of Starbucks customers responded positively, compared to 44 percent of Dunkin’ Donuts customers. Byrne says all of these factors signal a positive message for franchisees eyeing the West Coast. “The west is a mature market, so it might be harder and an uphill battle to chisel out a spot for yourself, but ratings show there may be good reason to go after it,” he says. What’s driving the Dunkin’ love? An article in the Seattle Times claims that New Englanders foster an “unconditional love” for home-grown Dunkin’ Donuts, a fondness that Seattleites just don’t harbor toward Starbucks. Reasons cited for this disconnect included a regional disdain for large corporations in favor of the independent guy; lingering animosity over former Starbucks CEO Howard Schultz’s sale of Seattle’s NBA team; and a common distaste for Starbucks’ beans. But for many, it is simple math; Dunkin’ Donuts offers a quality product at a better price. “For customers who enjoy purchasing coffee away from home on a daily basis, Dunkin’ enables more visits. It cuts across household income levels, while Starbucks can’t do that. They don’t use price as a driver,” says Byrne. Throughout New York, Starbucks is prominent, particularly in the borough of Manhattan. 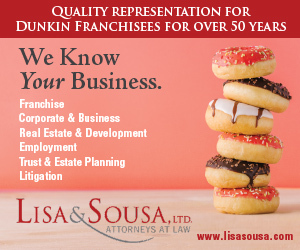 But, because Dunkin’ has greater presence in the City’s outer boroughs, Dunkin’ boasts the honor of being the largest brand in the nation’s No. 1 market. According to Valencia, Dunkin’ has a dedicated following. He sees a heavy morning crowd, which is good news, given the numerous coffee carts and other options all around the City. “Coffee fans like our product. Those looking for more of a milk-based product seek Starbucks,” he reports. Franchise owner Bill Daly, with stores in both New England and Florida, calls his New England customers an extremely faithful group—with ties that even reach to certain employees. “In one New England store, we have had the same woman open up at 4:30 a.m., five or six days a week, for 12 years. She comes in ahead of time, lines up about 15 pre-labeled coffee cups for her regulars, and is ready for them – and they love it,” Daly says. In another shop, he adds, the employee who runs the drive thru recognizes the regulars, just by their voice. At the end of the day, winning the loyalty of customers is the cornerstone of any successful business. 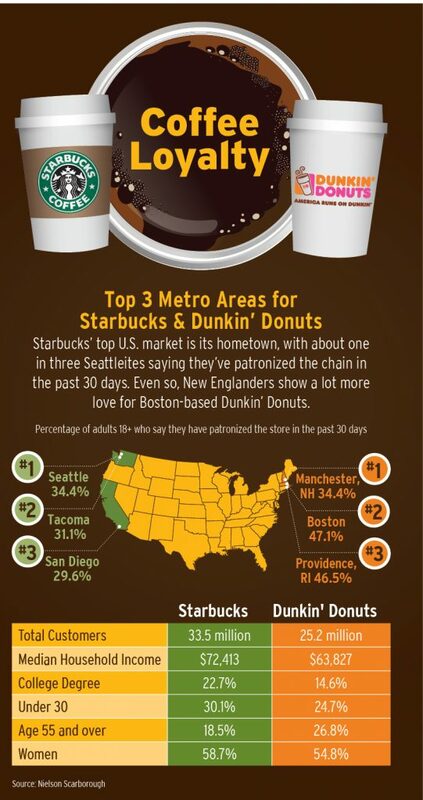 And according to both statistics and observations, Dunkin’ Donuts just may be beating the competition on this front. “The needle is pointing in the right direction for Dunkin’,” summarizes Byrne.